The Gallery Gamble and SSsnakes and Ladders were published by Bushfire Press and are available from me. 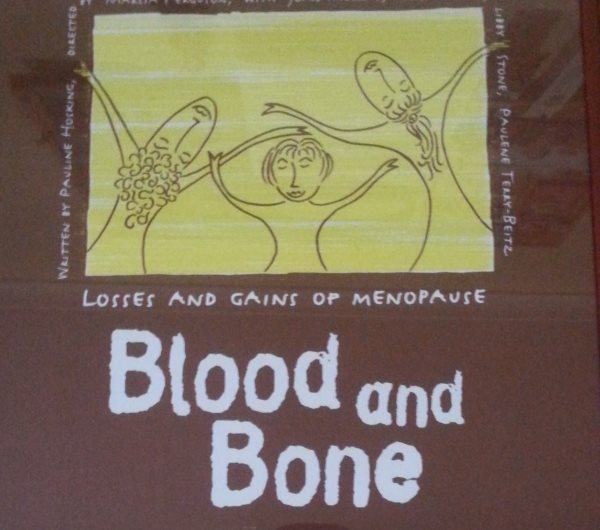 Blood and Bone - Menopause - The time of your life! Blood and Bone - The title says it all. In this one hour play four women confront the realities of the next period of their lives with humour and sensitivity. It was performed at La Mama Theatre and The Royal Women's Hospital, and had three separate tours of Victoria and South Australia including a performance at the 5th National Rural Health Conference in Adelaide. The play was funded variously by VicHealth, the Besen Foundation, Arts Victoria, The Jean Hailes Foundation, Helga's bread and the Australia Council. It usually formed part of a women's health day run by local community health services. My Bed is a Crocodile. My Bed is a Crocodile. Andy is a 17 year old boy with schizophrenia. His older sister and father struggle with confusion, guilt, jealousy and anger on their way to gaining an understanding of his illness. The play ends on a positive note with Andy regaining some control over his life. It can be performed with four characters and has a running time of one hour. During its first tour the play was performed to over 1,120 secondary school students. After each show a panel of mental health experts and/or clients was available to answer questions from the audience. The second tour concentrated on Western Victoria and a performance for the Rural Psychiatrists Association in Ballarat. 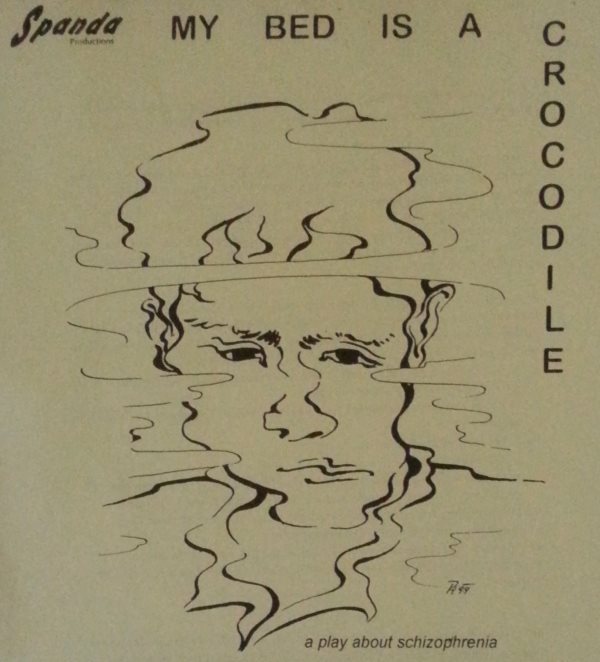 My Bed is a Crocodile was funded by VicHealth, Sane Australia, The Sidney Myer Fund and the Besen Family Foundation. Better Than This is another YA play, also included in the VCE Playlist for Drama and Theatre Studies. The play has a cast of three and runs for one hour and ten minutes. It deals with three 'at risk' Year 11 students in a country school. Lucy has a diagnosed eating disorder. Tam is a Vietnamese Australian whose parents arrived by boat in the 1970s. Tam hates the country town his family recently moved to, is severely depressed and refuses to speak. Cliff is a bully, especially vicious to anyone he suspects is homosexual. His actions, not surprisingly, hide his greatest fear. All three are placed on a special program within the school. The program works for two of them. 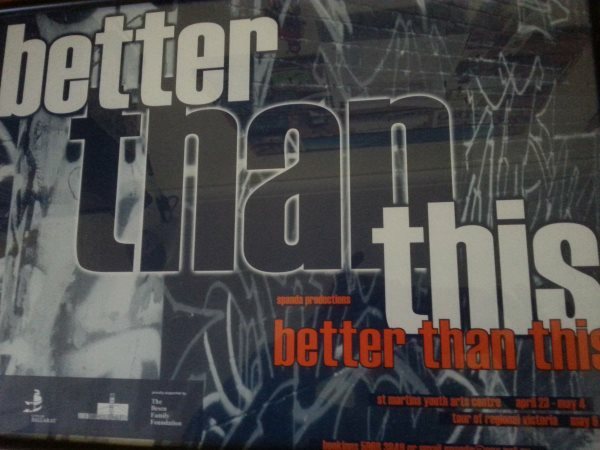 Better Than This was commissioned by the Grampians Psychiatric Services as part of their Good Mental Health Program in schools with additional funds from Vichealth and The Besen Family Foundation. The play toured country Victoria, had twelve performances at St. Martins Youth Arts Centre and an additional performance for absolutelywomen'shealth at the Royal Women's Hospital. After each performance a panel of mental health workers/youth workers led a discussion with the audience. Over its two seasons it was performed to approximately 1,900 young people. It was the Plenary Play at the 2002 Achieving Together Conference at the University of Ballarat. 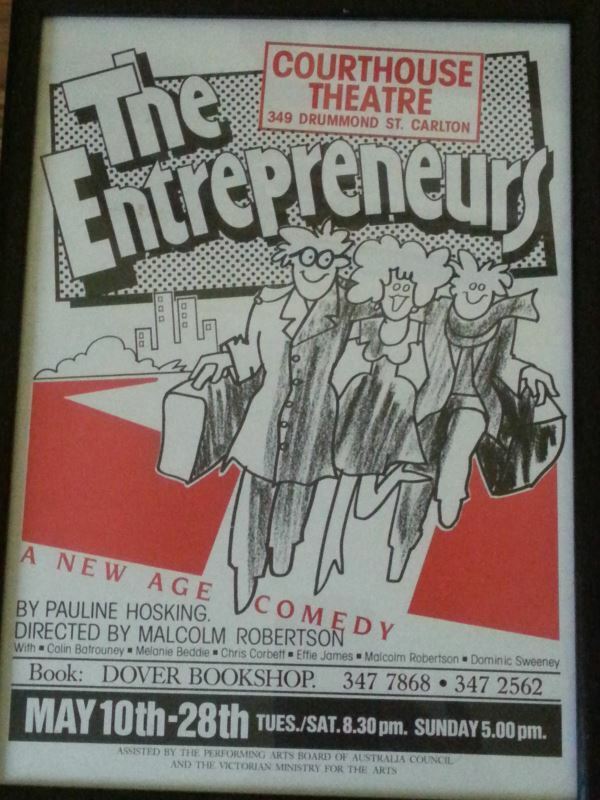 The Entrepreneurs is a comedy that can be performed by four or more actors. Heavily influenced by New Age hype, two out-of-work actors come up with the idea of Predeathing - a series of workshops to help people overcome their fear of dying. Surprisingly, despite the fakery and pretention, predeathing really works for some. This play has been performed by the Melbourne Writers Theatre, the University of Tasmania Drama Department and (in May 2015) by Hillbrook Anglican School in Queensland. 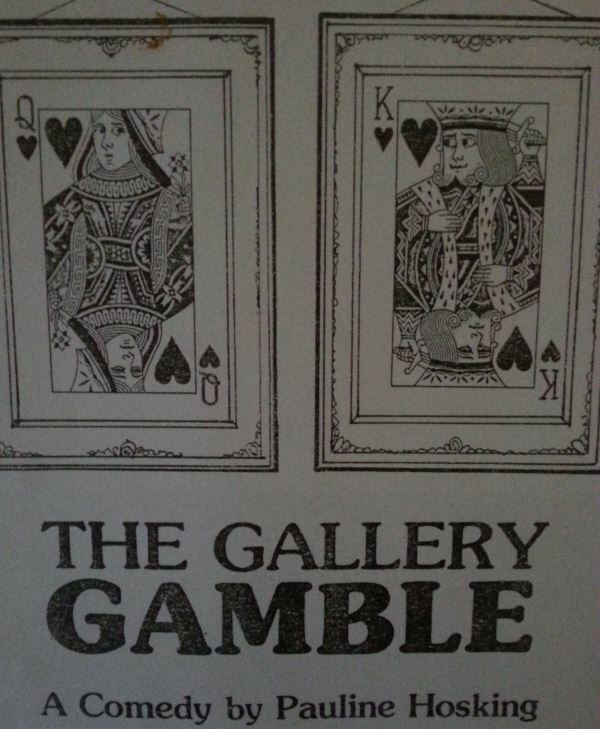 The Gallery Gamble is a two act, large cast comedy for amateur and community groups. It has had three different productions in Melbourne. When ambitious Mike Beveridge becomes the Director of the Tullaroop Art Gallery he thinks it's the first step in a glittering career. However, the Gallery is failing. If he doesn't do something quickly the City Council will close it. While the locals rarely visit the gallery, they do love a bet. With the help of Sabrina, a local school teacher and love interest, plus a gang of feral kids, Mike decides to run a book on the Annual Art Show. All of a sudden the town is interested. The day of the actual judging (by a big name critic from the smoke) turns the place into a frenzy. The play was published by Bushfire Press. I own the rights and any enquiries should be directed to me. 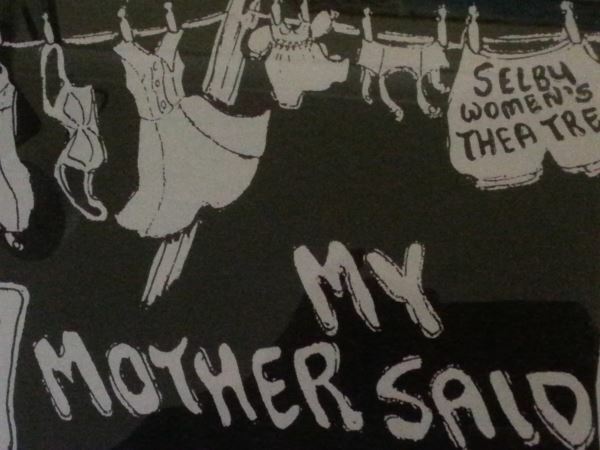 My Mother Said was written for the Selby Women's Theatre and had two sell-out seasons. Four older women relive their experiences with their mothers - one was over-protective, one was very critical, one was loving, one was absent. Funny and poignant it comments on the changing role of women from the 1960s to present day. To read this script please contact me. Hot Night in the City is a collection of three, two-handed short plays. They can be performed by six separate actors or any combination. The first three were presented at La Mama Theatre under the title Chameleons. The plays are linked by a hot night and the possibility of violence. River Stone - uni student Laura discovers that, sadly, love doesn't last forever. The Grand Carpark - can Joe trust an alcoholic who promises to stop drinking - tomorrow? Geranium - if the world is a cold, dark place without justice, is there any point in watering a geranium? Sssnakes and Ladders full length play, can be performed by five or seven actors. This comedy is a critique of the public service, it's games, rules and lack of responsibility. It was performed at La Mama Theatre and published by Bushfire Press. Contact me for a script. For permission to read and/or perform any of these, please contact me. The first six plays were printed in the N.S.W. School Magazine. All plays are between 10-15 minutes long. Monster Vacuum Cleaner - (10 speaking parts) Diana invents a formula which turns the classroom vacuum cleaner into a hungry monster. This is a play best read aloud.